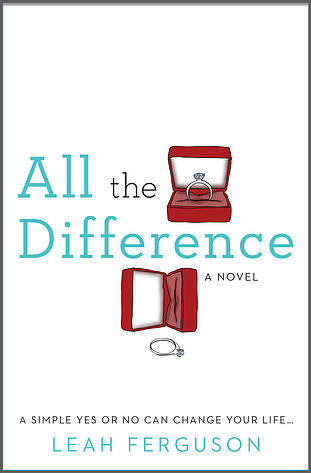 Up this month is Leah Ferguson’s debut novel, All the Difference. What struck me most about this book, even just reading the back cover description, was the unique plot structure. The story opens on New Years Eve with the main character Molly being proposed to by her boyfriend Scott. Earlier that day she learned she was pregnant. He doesn’t know about the baby and she’s not entirely sure how to answer his question. From that moment forward, in alternating chapters, we learn what happens if she says yes versus no to his proposal.You read that description and think, so the story moves forward but in two different directions? How does that work? All I can tell you is that is works really, really beautifully. And in the end Ferguson draws out some very poignant thoughts about fate, personal choice and resilience. It’s that last one, resilience, that really stood out for me. Molly has a lot on her plate (and it’s a very organized, planned out, everything in its place plate): an unexpected pregnancy, a super high-stress career, a rocky (to put it lightly) relationship, and best friends going through some tough stuff. Some things slide off that plate, and they don’t all get picked up off the floor by the end of the story. Instead Molly has learned to be okay and ultimately thrive in her new normal. I LOVE this. Other awesome things that stood out for me: the music and the setting. There are lots of awesome nods to 90’s bands (which are all kinds of nostalgic for me). Seriously, so many music references that in the middle of reading I had to create a Liz Phair Pandora station. All the amazing music listening happens in Philadelphia. Ferguson’s descriptions of neighborhoods, streetscapes and restaurants really bring the city alive. Molly has to make some decisions about where she lives in the novel, and you are right there with her emotionally because you’ve fallen in love with the city she lives in. While you’re reading, All the Difference, I would suggest sipping on Troegs Brewing’s Nugget Nectar. Leah made this one easy on me. First there’s the Pennsylvania connection. I don’t always match beers to book settings, but when the setting is so much a part of the story – it seems almost mandatory. Second, she actually mentions Troegs in her acknowledgements – so how could I not. I’m going with the Nugget Nectar, because its name makes it sound far lighter than it is. You hear “nectar” and you think honey and figs and sweetness, but this is actually an amber ale LOADED with strong citrusy hops. It’s label features a fist chrushing a giant hop bloom. Similarly, when Molly was pushed and squeezed she learned that she was full of a whole lot of strong stuff. I am super curious to know whether you are a plotter or a pantser (someone who writes without outlines, i.e flies by the seat of their pants), especially given the unique nature of your novel with the alternating story lines. Oh my goodness. I want so badly to be a pantser (and my heart wants me to pants it, too! ), but it turns out that I’ve plotted myself into a novel-writing corner. See, ALL THE DIFFERENCE was drafted during NaNoWriMo (National Novel Writing Month), where I committed to writing 50,000 sort-of coherent words in 30 days (MADNESS.). Since I knew I wanted to craft a dual storyline, I sketched out a detailed timeline (it looked like a flowchart, really) ahead of time to keep me focused. Since my novel takes place over the course of a year, which each month flipping to one of two different storylines, there was no other way to do it, especially since I was writing chronologically. I can’t imagine writing a novel like mine without thinking it through ahead of time, pantser or not. This time around, I’m trying to sell a proposal for Book #2 before it’s actually finished, so I’m honing a 10-page synopsis that outlines the entire novel (yep, before it’s finished!). It’s really, really difficult to try to come up with an ending before I’ve even fully revised a beginning, but it’s what I’ve decided to do to have that bit of security heading into the writing this time around. Once I’ve got a better hang of this “author” gig, I’ll totally try to pants it, but right now I’m a charting, outlining (albeit reluctant!) plotter. All the Difference is set in Philadelphia and I think I noticed an online conversation between you and Kristin Contino indicating that you both referenced the same bar in your books. Are all the bars and restaurants actual places? If so, what made you decide to use real locations? You’re right, Mary Chris! It seems that Kristin and I have some similar settings in our novels (hers is a debut, too, called THE LEGACY OF US [see last month’s Books & Brews]). Every specific reference to a bar or restaurant in ALL THE DIFFERENCE is real, down to the current menus. Some of them–like McGillin’s Olde Ale House, which is what Kristen also references in her book–are places with which I was very familiar at one time (I may have spent a little too much time out and about when I lived there in my early 20s), and others are ones I’ve researched or gotten recommendations for from acquaintances who still live in the area. I studied, worked, and lived in and around Philly for seven or eight years, and it’s still a city I absolutely love. I wanted to pay tribute to it, in a way, and the city sort of became this kind of tertiary character in the book: that’s why the descriptions of Old City, Center City and Rittenhouse Square are woven throughout the story–they’re neighborhoods I hoped would convey just as much about my main characters as their dialogue and actions. This is your debut novel. Can you talk a little about what the experience of launching your first book into the world has been like for you. Oh, gosh, I could talk your ear off about this. Launching my first book has been something that I still don’t quite understand as real, to tell you the truth. I started writing ALL THE DIFFERENCE with the hope and intention to hone it, try to find an agent, and see it out in the world. I didn’t think any further than that with regard to marketing, and genre, or the publishing business itself: I just wanted to see my novel on a bookstore shelf! It has involved an overwhelming, surprising amount of promo work–keeping up with social media and my website and giveaways has been a full-time job in itself, which is really strange ground for somebody who likes to sit at home quietly and read a book. But this process has been amazing. I’ve learned how to craft a better, more readable novel, and I’ve made professional friendships that are, I hope, here to stay. And the support of friends and family and strangers–the ones who bought the book, cheered me on online, who showed up to my first signing and the afterparty (it was at a brewery, Mary Chris–you’d be proud of me! )–has been beyond what I expected. I am so grateful for the people in my life. And I’m moved beyond words that something I’ve been dreaming of doing forever is actually the path that I might actually supposed to be following. And finally, what’s your favorite beer? BEER! I was so looking forward to this question. My favorite beer changes seasonally, so right now I’ve been reaching for Troegs’ Hop Knife (as a central PA girl, I’ve got an ingrained devotion to Troegs beers, which is fortunate because they’re excellent), which is perfect for this early fall weather. But I alway make sure we have Sierra Nevada’s Torpedo Extra IPA in the fridge year-round. You don’t need a season for that beer–it’s good all the time. This entry was posted in Books & Brews and tagged All the Difference, choices, craft beer, Fate, Leah Ferguson, life paths, Liz Phair, motherhood, Nugget Nectar, pairings, pregnancy, resilience, road less travelled, Sliding Doors, Troegs, women's fiction by marychrisescobar. Bookmark the permalink. Mary Chris . . . have you thought about blogging your way to a Books & Brew book? Your pairings and coverage of fiction are so good. I love reading them because I learn about two things I care about – books and beverages! Sounds great–I love alternate-timeline stories! Me too and this one is really, really well done! Thanks for this review – I’m planning to put All the Difference on my book club’s poll for next month. My favorite beer, by the way, is Leffe Blonde – love me some Belgium beers! I think your book club would LOVE it. It should generate some great discussion. I love books that tackle the big “what ifs” in life. I also love Belgium and Belgium-style beers and Leffe is a great one. Allagash White is probably my all-time favorite beer if someone were to force me to choose. This book is definitely on my TBR list. I can’t get Troegs beer where I live (why, Missouri, WHY???? ), but if I ever make it to PA, it’ll be on my TBD list. I love your pairings. So clever and educational! What a shame about no Troegs in Missouri. Maybe it will make its way there one day soon – you never know. It’s going on my to-read list. I love well-written stories with alternate timelines. Excellent, Wendy! I think you will really like ALL THE DIFFERENCE! I love ‘sliding doors-esque’ story lines. Thanks for the review. Yes! Me too! I love books/movies that tackle those “what-if” questions that we can never really know the answers to in real life. Wow – what an interesting book! It really was, Tracy! A great read for anyone, but as a writer, I was fascinated with how she navigated the two story lines. It was super cool. I think you’d really like it!